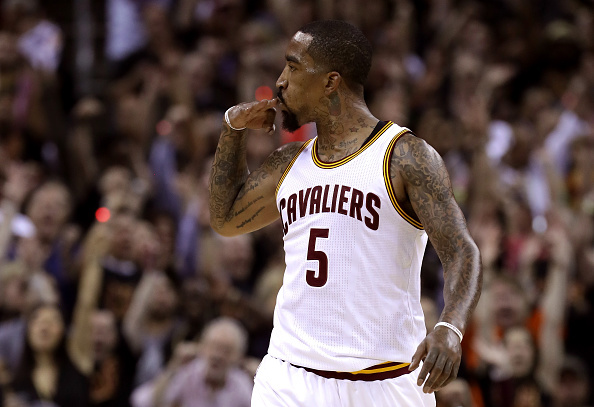 If you ask me – and, frankly, anybody else – J.R. Smith is going to be a Cleveland Cavalier this year. Sure, he’s still floating around as an unrestricted free agent. And no, we really haven’t heard too much about the negotiations between him and the Cavs. Still, the odds still favor Smith suiting up with the wine and gold this coming season. The obvious question, then, is if it’s such a certainty, why is he still unsigned? If every indication is that Smith will return to the Cavs, why are the contract talks taking so long? Well, thanks to Cleveland essentially bidding only against itself, the negotiations are currently stalled. Smith has struggled to generate interest outside of Ohio, giving the Cavs a significant advantage. However, Smith and his agency aren’t ready to buckle to this just yet. As a result, despite a collective belief the two sides are eventually going to settle on a deal, this whole situation could get messier before being resolved. This is now the second summer in a row Smith decided to bet on himself, opting out of his contract in hopes for more money. Last year, the plan backfired. No other teams expressed interest, and Smith ended up back with Cleveland making less than he would’ve had he just opted in to the next year of his deal. Now, with a championship ring in tow and two straight years without any significant on or off-court incidents, Smith is giving it another shot. Yet, here we are again, watching a standoff between him and the only team showing interest and waiting to see who budges first. What makes this situation difficult is how understandable the respective logic is for each side. The reason Smith isn’t getting any offers outside of Cleveland is because of his troublemaker reputation. However, while other teams may see him as a potential headache, he’s become a key player for the Cavs. Consistent scoring, a vast improvement on defense and his earning the starting shooting guard position all helped to make Smith a crucial piece to the puzzle in Cleveland. So, in a sense you can definitely argue the fact he deserves a raise. By just how much, though? This is where we get into the Cavs’ position, and it makes just as much sense. The latest number Smith was reportedly seeking was $15 million per year. Whether or not you feel he’s earned it is another story, but when you see how much money has been thrown at lesser players this summer, you can at least get why he’s stumping for this kind of salary. Of course, Cleveland would feel more compelled to give in to this number if the market was more intense for Smith. Again, as it stands now, no other team is even talking to him, much less offering him a contract. So, if there aren’t any competing offers forcing you to pay $15 million, and you’re already pushed well past the salary cap as it is, clearly you wouldn’t feel as though you had to make that offer. Last year, Smith gave in under similar circumstances. Things are different this time around now that he’s signed with Klutch Sports. The same agency had no issue dragging things out until last autumn during fellow Cavalier Tristan Thompson’s negotiations, so it’s tough to believe things will be different with Smith. At the moment, it sure seems like the similarities between Thompson’s lengthy contract talks and Smith’s are endless. Don’t be surprised if this remains the case the closer we get to Cleveland’s season opener. Again, it makes sense for Smith to want an upgrade in pay after his success with the Cavs continued last year. It also makes sense for Cleveland wanting to avoid out-bidding itself for a player nobody else is vying for. As we now know, though, the problem with having strong logic on both sides of the fence means each party is going to be very resistant to budging. Knowing this, it’s easy to see how this whole ordeal could get much rockier before finally coming to a conclusion.